From its very beginning in 2013, it was the goal of Venice MainStreet’s to create one of the most premier Blues Festivals in SW Florida attracting quality, internationally renowned musicians. Bringing audiences of thousands, the Venice Blues Festival has become just what we imaged. The event benefits Venice MainStreet and the Venice High School Band. 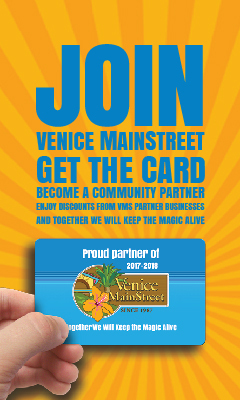 It is the intention of Venice MainStreet to highlight and support the Venice business community while bringing international talent to our little slice of paradise. Café Venice, Sharky’s, Sonny’s, and Brew Burgers will be selling food that day while our sponsors include Tervis Tumbler, Fifth Third Bank, Venice Regional Bayfront Health, James Griffith Salon, and Applebees. We are excited to announce that the multi-talented Grammy Award- winning blues artist, producer, composer and actor Chris Thomas King will be performing on stage at the festival along with a list of other great Blues musicians. King was chosen by the Coen brothers to play the role of itinerant bluesman Tommy Johnson alongside George Clooney in the movie “O Brother, Where Art Thou? (2000).” Larger than life on the silver screen, Chris Thomas King, acoustic guitar in hand, captivates audiences the world over with his authenticity as a folk blues artist and promises to deliver the same to our Venice audience. Also on the bill is Robert Sampson, from Jacksonville IL, a The Blues Foundation International Blues Challenge finalist and, the legendary blues artist Lazy Lester. Lester is the last of the true Louisiana born blues masters who has made a significant impact on the Blues and Rock and Roll that we listen to today. Back when blues was king and South Louisiana was the breeding ground for a blast of some of the most memorable American music ever recorded, Lazy Lester was at the heart of it all. The evening before the Blues Festival, Friday, November 18th, downtown and along Miami Avenue, we will host the Blues Crawl and Block Party as a free pre-party to the Venice Blues Festival. There you will find local Blues musicians at the Centennial Park Gazebo, in bars and eateries. The 200 block of Miami Ave will also be closed down for a block party with a stage and a beer and wine vendor from 5:00 pm to 10:00pm. If you can’t get enough Blues we will end the festivities with a Venice Blues Festival After Party Jam at the Venice Community Center, November 19th 7-11pm, where internationally known Harmonica Player Hurricane Hawk and The Invaders will perform. Entrance is $5 at the door.